New South Wales minister for Planning and Housing, Anthony Roberts recently launched the Greater Newcastle Metropolitan Plan, signalling a new period of investment, growth and development for the waterfront city. Describing the Metropolitan Plan as the key to unlocking the future of Greater Newcastle, Roberts said it builds on the existing $650 million investment in the transformation of the city and will focus on creating more job opportunities, new housing and attractive public spaces connected to better transport. Key initiatives under the ‘Revitalising Newcastle’ project include more education and affordable housing opportunities, the Newcastle Interchange – a new multi-modal transport interchange at Wickham in the city’s west, and wire-free light rail between Newcastle Interchange and Pacific Park, just 200 metres from Newcastle Beach. According to Roberts, a strategic objective of the new Greater Newcastle Metropolitan Plan is to attract more businesses and skilled workers as well as maximise the commercial business opportunities of the Port of Newcastle and Newcastle’s expanding airport, bringing greater exports and critical tourism capital to the city. 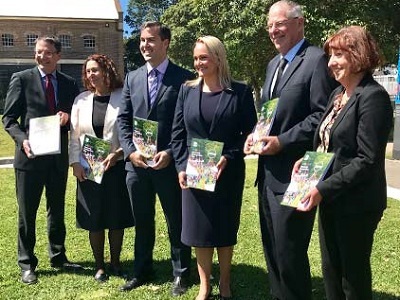 “The Plan will also allow Greater Newcastle and the Hunter to leverage growing demand in Asia for agricultural produce, increasing environmental tourism and greater demand for educational opportunities and innovation in medical research,” he says. Roberts added that the plan also demonstrated the NSW Government’s firm commitment to bring Greater Newcastle’s lifestyle city vision to life.